While writing my last post, I had one eye on the television, watching Rick Mitchell, who was telling me that a tornado was pretty much headed straight towards us. Fortunately, it met up with a cold front, which effectively murdered it before it arrived at our doorstep. I was completely distracted from the looming tornado, however, by Rick's necktie. It was striped, sort of Easter colors, very pretty, very long. 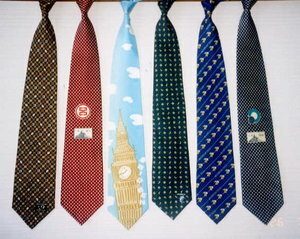 Now, I have had a theory about neckties for quite some time, so I Googled the history of them. They've been around a long time, since the early 1600s. Here are some necktie facts I found interesting. 1. The Windsor knot was named for the Duke of Windsor, although he didn't invent it or use it. He liked big, fat knots, but the way he got them was to use thicker fabric. My guess is that he never figured out how to tie a Windsor knot. 2. A necktie can be seen as a sign of membership, i.e. belonging to a certain school, or the military. Or the I Wish I Could Breathe Club. 3. In many hospitals, ties are thought to aid and abet the spread of disease, apparently since they are cleaned less than other articles of clothing. Doctors routinely lean across patients and their ties may brush them, pick up some nasty thing, and carry it to the next unsuspecting and trusting fool. I'm glad my doctor is a woman. 4. People in Iran do not wear ties because they believe them to be a decadent symbol of Western oppression. Really? That makes about as much sense as some of the other things they believe. Okay, my theory is that they are part of the male mating ritual, designed to draw attention to certain parts of the anatomy. Think about it. They aren't comfortable, but they continue to be an important accessory in the average man's wardrobe. Because basically, they are one giant arrow pointing to . . . well, you get the picture. That's my theory and I'm sticking to it. It always ends up there, doesn't it. I've had the same thought about ties. Figures. That's men for ya. Ok well, I'm not ever going to be able to look at a man wearing a tie in quite the same way. jeff - Yeah, it kinda seems to. heather - I knew I wasn't the only one! tracy - I was afraid some people might react that way. I thought about not posting that, but I hate censorship! I thought your readers would like to know that the dirtiest thing in a doctor's office, is his tie. LOL, Linda! It will just make for interesting Sunday mornings since our preacher always wears a tie. ROFL! bill - I was surprised to read that. Ick. I commented yesterday, on how funny your blog was, and how much I enjoyed it-----and it would NOT print!!! Went thru 3 or 4 sets of I.D.letters, and finally gave up. So here's hoping I get to say "Hi"----and love you!!" lois - Computers are nice when they work right. Glad it got through, I love you too!